Delving into the station�s seedy Spike neighborhoods, the heroes confront the gangs and discover that both were paid to start the riot and that the true conflict is between two rival mining companies battling over a new arrival in orbit around the station: a mysteriously deserted ship and the strange asteroid it recovered from the Drift. 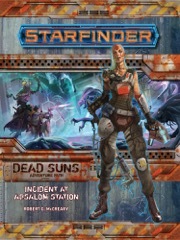 "Incident at Absalom Station," a Starfinder adventure for 1st-level characters, by Robert G. McCreary. A gazetteer of Absalom Station, by James L. Sutter. Magical relics inspired by the lost planet Golarion, by Owen K.C. Stephens. An archive of new alien creatures, by Jason Keeley and Robert G. McCreary. Statistics and deck plans for a new starship designed just for the player characters, plus details on a new planet in the Codex of Worlds, by Robert G. McCreary.